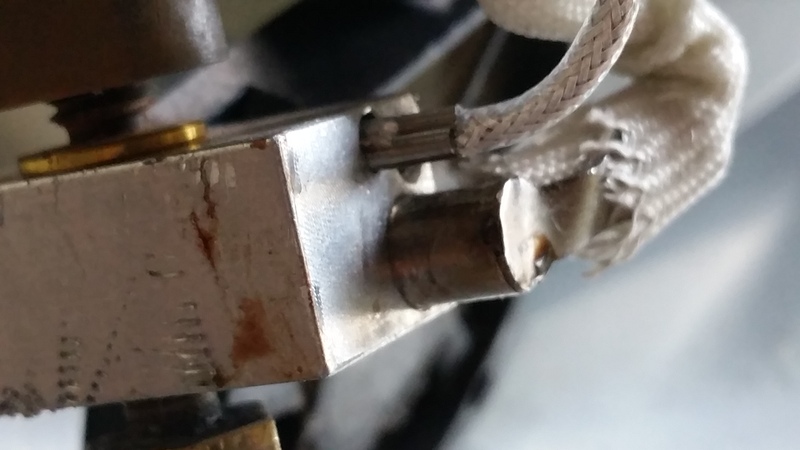 I just recently melted the wires of my heat probe while cleaning a nozzle. I know, I'm an idiot. So I ordered a new one, replaced it into the heat block, screwed the holding screw in place, plugged the socket end back into Temp 1 and now when I go to heat my PLA, the safety trips and reboots the printer. I have checked it over and it keeps shorting out. Have I got a dud probe on my hands or have I forgotten a step in putting it back together? I suppose you do it with the power unplugged? Also after unplugging it do turn on/off to remove power on the capacitators. Also what you mean by shorted? Spark? Doesn't work? What you see? Photos? I set it all up with no power at the wall socket. Ok. Here is the hot end with probe out. Here's how I plugged the probe into the block. Put in the securing screw. And attach the socket end to Temp 1. This is a video of what happens when I apply power and tell it to heat. I have also tried this without the securing screw in just in case it was bridging between the probe and the heater element. Hope that makes it clear. Same result every time I try it. Yeah the hotend assembly is not right. The barrel can't be inside all the way. That's how it should be assembled. But to tighten it right is better to insert the barrel a 0.2mm (a finger nail or less) in, so you have some play to tighten the nozzle while hot. I'm away for the day but will read and check all your other points later. About the short. I had exactly that with a bad heater cartridge that was just broken inside. If you have a potentiometer check the heater Ohm. It might show if is having an internal short or cable broken. Try to change the heater to the bed heater and pt100 on bed temp. 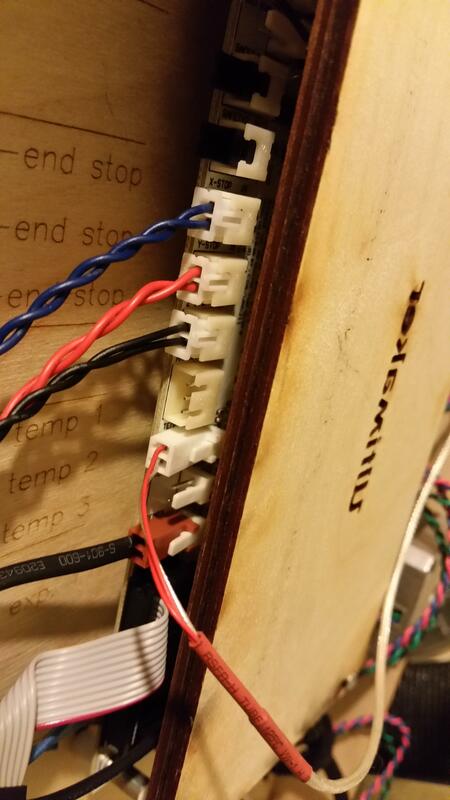 And heat the bed (that will heat the hotend heater). If that works, then place the bed and temp sensor on the hotend plugs. This way it might be possible to debug if is the cable or the board (most likely is the heater cable). If in doubt, ask again. I think @gr5 has much more experience checking the correct ohm and the theorical 'right' numbers you should see on a potentiometer. I don't have a potentiometer. 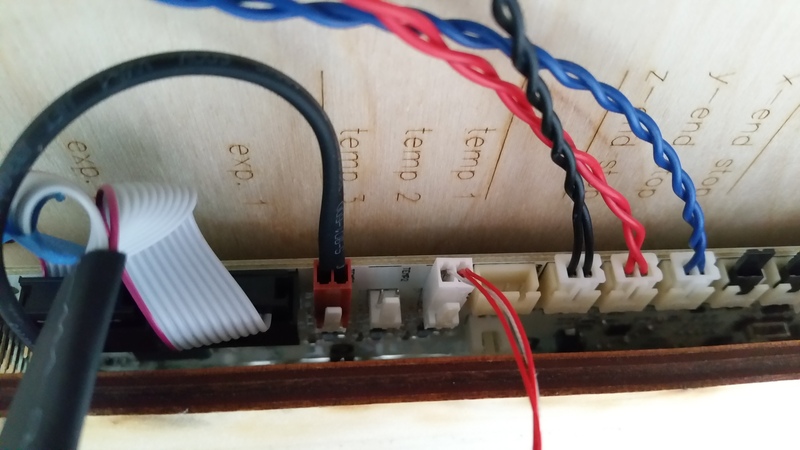 And the connections for the heater bed are just bare wires so I can't swap the connections over to test as you've suggested. To be fair, the nozzle has never really been a problem, prints perfectly fine so long as I don't melt important wires. But I will re-adjust this as you've pointed out when I get it capable of heating up again to see if I get a better result. Thanks for the tip! 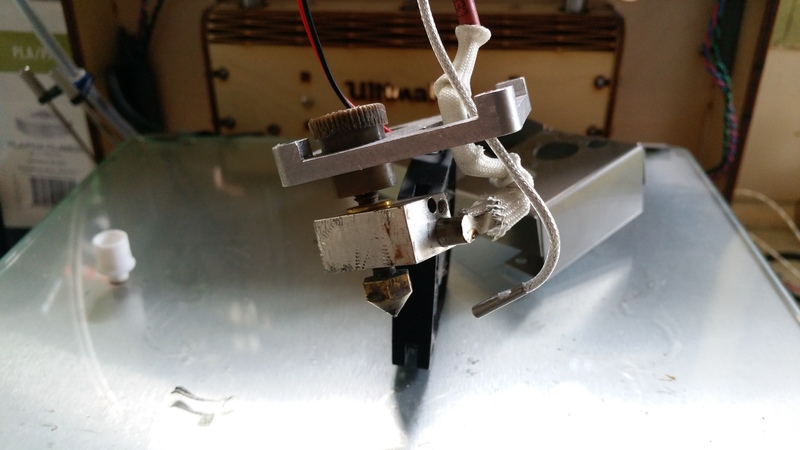 Of course if you move the heater to bedheater you will also need to move pt100 from extruder 1 to the bed. It could be a fast test to see if heating bed or hotend makes the PSU to reboot. As you can see here, these a wires with premade plugs. They will not physically fit into the sockets for the bed heater. Not without cutting the wires. Tried posting from my phone, didn't work as expected. That's the pt100 heat sensors, the heaters are in the other side. Take out the wood cover to access better. Yes. I know. I am well aware of what side I photographed. Let's make this really simple. Left side, the PT100 side. It has sockets for the 2 pin wire plugs. Right side in the highlighted area, the bed connections which are bare wires that feed into the sockets with no plastic plugs. I can't put the PT100 into the bed without cutting the plug off the wires which is something I will not do. That's why you need to takenout the wood cover. It has a clip system that once pressed it can release the 'bare' wires of the heaters. I think the clip sustem is described on the manual. My board is old 2.1.2 and it uses other clamp system. The "clip" system has an orange thing that you press quite hard to get the heater wires in and out. You have to remove the wood panel to get at those orange things that you press. Anyway - it looks like your heater is shorted. temp sensor - plugs in to left side of photo above. It has a resistance of around 108 ohms at room temperature. This is working fine - don't mess with it! heater - plus into right side of photo above. It has a resistance of around 24 ohms normally. This is not working for you. Wires probably shorted in the photo but can't see it as they are covered. I know your temp sensor is working because in the video it said 0/25 meaning it is reading 25C which is perfect. Anyway I think your heater wires are touching each other. You should take them out and put them back in and try again. Yank on them to make sure they are in there good and won't come out easily. 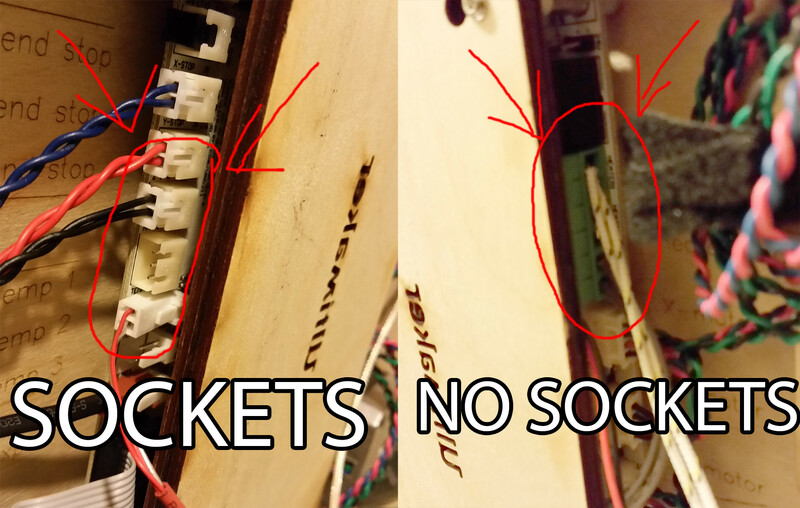 Also make sure the metal of the wires is touching no other wires or no metal on the circuit board. If it all looks good and still reboots when you turn heater on then I would get a new heater. I mean maybe first find a friend who has a multimeter and make sure it is at 0 ohms as I suspect. It should be around 10 to 25 ohms depending how many watts of a heater you bought. Maybe you got the wrong type of heater? for example a 35W heater designed for 12V will be 140W with 24V power supply and do exactly what is shown in the video. I recommend you get heaters from 3dsolex. I think there might be a reseller in UK. Ok. All fixed now. It was the heater probe but not the end at the board. 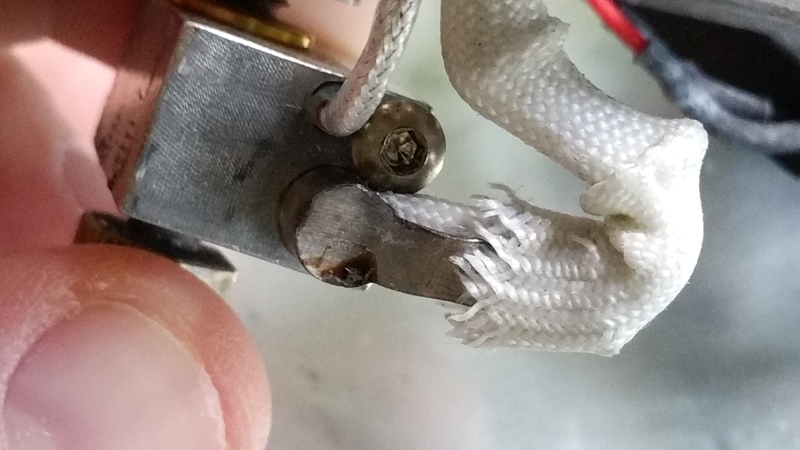 The wires had somehow frayed near the hot end and were shorting out there. Replaced the heater probe and it's back up and running.